The skatepark is open and being used by many! Please follow the guidelines posted and ENJOY! A number of students from Union Gap School went to a City Council meeting and voiced their desire to have a skatepark in Union Gap. The City Council committed $50,000 towards this project, the City received a $7,500 grant from Tony Hawk Foundation, a $100 donation from the Union Gap Lions Club, and fund raised until the goal was reached! The total cost of the project was $145,000. DAVE BUTLER JOSHUA McCAIN PAT SUNDBERG WILSON ORCH.& VINEYARD SUPP. DAVE MATSON JOSHUA MURR PATSY ROY YAKIMA YOUTH SOCCER ASSOC. 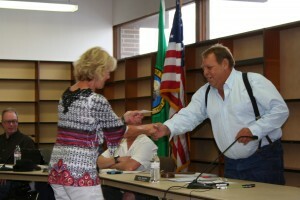 with a check to help fund a new skatepark. 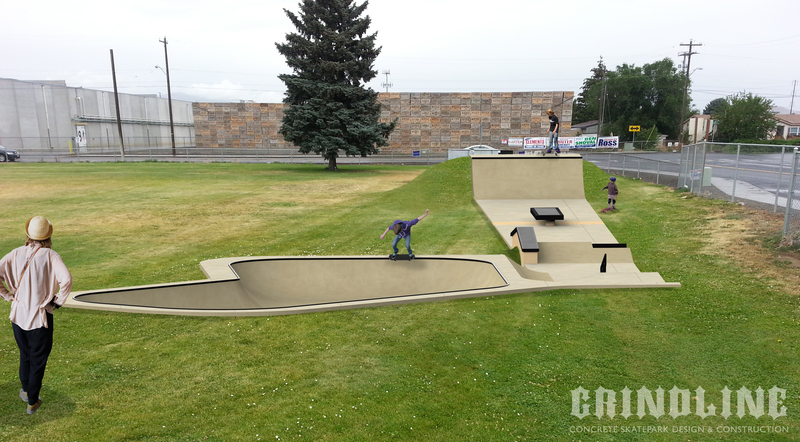 Preliminary design of the proposed skatepark at Cahalan Park.